First things first, Day of the Dead (Día de Los Muertos) is not Halloween. If you thought that it was, just un-think that. It is WAY more exciting and way more meaningful than Halloween. In fact, the celebration and festivities go on for over a week in Mexico! A group of young boys excitedly awaiting the start of the parade. But how is death a celebration? The only time we celebrate death in the States is when someone we hate dies. For example, when my neighbor’s French Bulldog Sydney (whom I despised) died, I felt quite celebratory. So to set things straight, Day of the Dead is not a celebration of their passing, but a celebration of their annual return to earth. It is a celebration of life and family. If you only return to earth once a year you’ve got to be starving, not to mention dying for an ice cold beer! Each family prepares accordingly, laboring over traditional dishes such as: mole and pan de muerto (bread of the dead), along with their loved ones’ favorite foods and beverages. Fresh pan de muerto rests after baking. But how will these souls find their way back home? That’s where the altars come in. Each family designates a part of their home to the altar. They decorate it with marigolds (the symbolic flower of Day of the Dead), cockscomb (the bright pink one that looks like a brain), fruit, mole, pan de muerto, candles, trinkets, photographs and lots of beer! Some families even believe that they must guide the souls to the altar and leave a trail of marigold petals from the door to the altar. Preparations begin weeks and months before this holiday, but there are three main days. Let me break it down for ya. The deceased children begin to return at midnight. Families spend all day (and days before) cleaning and decorating their graves. They then sit in the cemetery all night awaiting the return of these young souls. This is possibly the most somber day of the celebration, but it is still quite lively. Today is a celebration of the lives of the deceased children. There are many parades, festivals, and family gatherings. People also begin to prepare the graves of the deceased adults. In the evening they return to the cemetery to await the arrival of the adults at midnight. 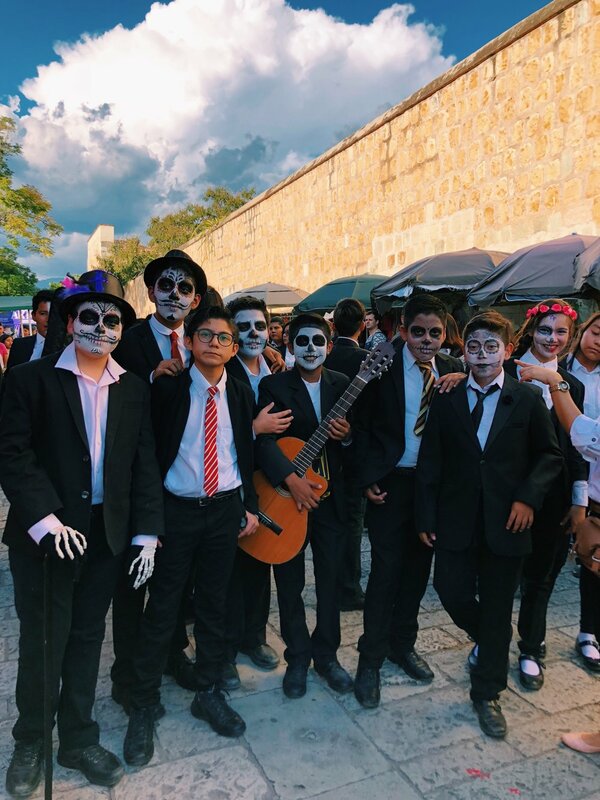 The cemeteries resemble a massive party: candlelight, live music, food vendors, alcohol (specifically pulque—an ancient Mexican beer-like beverage), face painting, and costumes. Everyone celebrates in different ways: some families sit quietly at the family grave while others play music and tell stories. Many families spend the entire night at the cemetery again. Today is the biggest celebration! It is an opportunity to party and celebrate with the returned souls. The streets are filled with parades consisting of live bands, children in costume, massive colorful hand-crafted puppets, and lots of dancing! 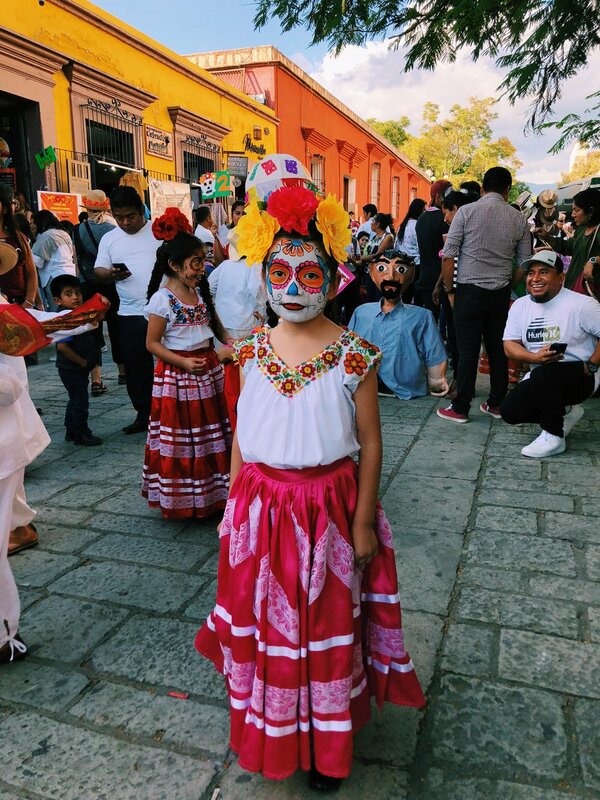 Throughout this entire week many people dress up as La Calavera Catrina — a satirical elegant skeleton who laughs in the face of death (I partook in this tradition — scroll down to see). Around 3 p.m. the souls depart from earth and the families set off fireworks or rockets to say goodbye. Later, the families will eat the leftover food and drink from the altar. **I recommend for you to watch the Oscar/Golden Globe Winner Coco. It is a beautiful representation of this vibrant celebration. When I first saw it I fell in love, but I was skeptical that the Day of the Dead could actually be that spectacular. After seeing the celebration for myself in Oaxaca, I realize that it’s even more magnificent than I could have imagined. Famous Oaxacan candlemaker, Viviana Alavez and her granddaughter. During our short time spent in Mexico we were welcomed into many strangers’ homes to join their celebration of this holiday. I was astonished that people would open their homes to foreigners on the single-most important holiday of the year. That would be like inviting strangers to your Christmas dinner or Easter brunch. Now, there are plenty of people in the U.S. who share their holidays with strangers and even dedicate their holiday to serving others, which I truly admire. But there is also a feeling of exclusivity during our holidays. Family only, no outsiders. I was inspired by the families we visited. At one home, we sat at a long table and the mother — clearly the head of the house — raised a toast to us. She thanked us for spending the evening with them and said that she wanted us to know that we are family, and as family she expects that we will return the following year to stay with them. Then she served us a full course meal, sharing her traditional mole and passing around a jug of mezcal. Can you imagine? The first thing you tell strangers in your home is that they are now family? This theme of genuine love and acceptance presented itself in several different homes that we visited. Not only were we accepted into people’s homes, we were also permitted to walk through the cemeteries and even decorate lone graves, in fact, this was encouraged. In the candlelit cemetery, my mother and I designed moving patterns with marigolds and cockscomb along a forgotten grave stone. We wandered through the cemetery, passing by families praying to their loved ones and many looked up to smile at us. Death is an equalizing force. 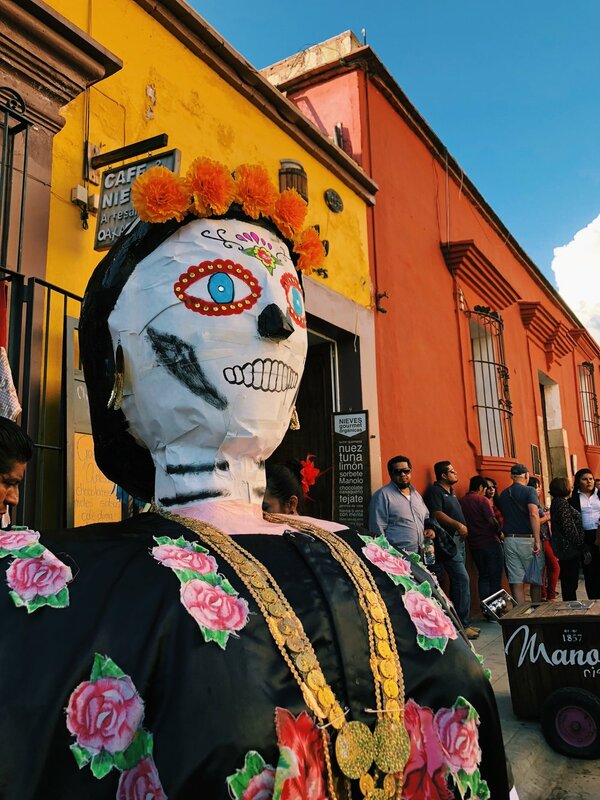 Day of the Dead is a liberating experience for anyone. It is a chance to reflect and remember special times. For richer or poorer, we will all return to the same soil. For me, this realization is comforting as it is a reminder that our time on this earth is short and we must celebrate it.